COLDCOCK Whiskey is returning to NAMM 2016! Catch your favorite COLDCOCK artists appearing at NAMM, autographing bottles of COLDCOCK Whiskey at nearby stores and enjoying some shots with their fans at the area bars and shows! COLDCOCK Whiskey will host special VIP areas at the Schecter Guitars booth and the Monster Products booth inside the Convention Center. While you are out and about outside the trade show, pick up/enjoy some COLDCOCK at the following locations: 99 Bottles and Cocktails, Anaheim Hilton, Anaheim Marriott, Anaheim Convention Center, Liquor Market, ABC Liquor, The Grove of Anaheim, The Yost Theater, The Juke Joint, The Good Ol Boys Saloon, House of Blues, Anabella Hotel, BevMo, Albertsons, Ruth Chris, and Morton’s. First, COLDCOCK Whiskey is sponsoring the Skinny’s Lounge NAMM Kickoff Party on Wednesday, January 20th at Skinny’s Lounge in North Hollywood, CA featuring COLDCOCK Artist Fused by Defiance. On Friday, January 22nd at the Yost Theater in Santa Ana, COLDCOCK Whiskey is sponsoring the NAIRMA Awards (North American Independent Rock Awards), hosted by Don Jamieson and featuring live performances by COLDCOCK Battle of the Bands winner City of the Weak and a headliner performance by Drowning Pool. The event will feature celebrity guest bartending with Don Jamieson and members of Drowning Pool. Be sure to follow Drowning Pool on Twitter at @drowningpool for your chance to win tickets to this invite only party! COLDCOCK Whiskey is proudly supporting multiple Schecter Guitars activities at NAMM, including the Schecter Guitars INDIE NAMM Party at the Juke Joint in Anaheim featuring COLDCOCK artist Radiodrone, taking place the same evening (January 22nd). 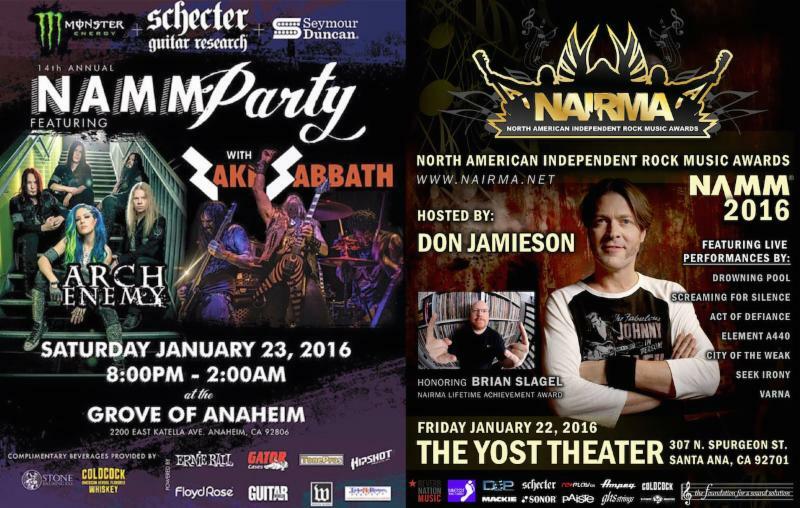 In addition, COLDCOCK Whiskey is sponsoring the Schecter Guitars NAMM Party on Saturday, January 23rd at the Grove of Anaheim, featuring Arch Enemy and Zakk Sabbath (Zakk Wylde and Blasko performing a Black Sabbath tribute set). Get your photos taken with the Romantic Rock girls at the COLDCOCK/Romantic Rock photo booth and check out the now infamous COLDCOCK Ice Luge. Before you exit the NAMM celebration, make sure to catch COLDCOCK Whiskey sponsoring the Gig Boss NAMM After Party, taking place on Sunday, January 24th at the House of Blues Anaheim featuring COLDCOCK artists 7 Days Away and Madlife. *** While out in Anaheim, be sure to catch COLDCOCK Whiskey Rider Chris Howell as he competes in the Anaheim 2 Supercross, taking place on Saturday, January 23rd at Angel Stadium. Follow @COLDCOCKWhiskey on Facebook, Twitter and Instagram for live updates at all of these events.